If you’re looking for the best rimfire scope and aren’t sure where to begin, ever fear. We put in a lot of time to research the most popular brands and top-rated products. We put together this rimfire scope review to make it a little easier for you to decide which one fits best with your needs. But before we jump into out rimfire scope reviews, let’s take a look at some of the important features you need to know about. Tube Size: All of the scopes have the same tube size: 1 inch. This isn’t really surprising! 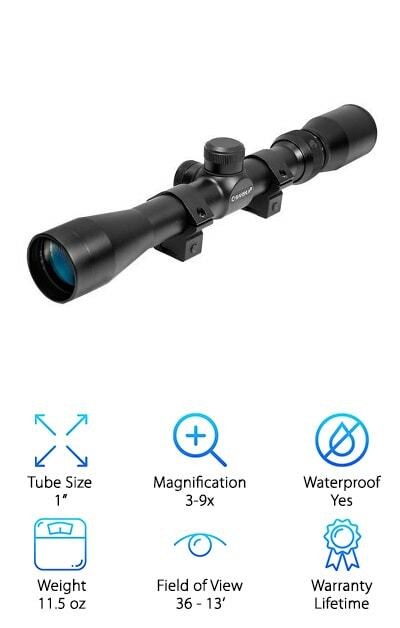 These scopes are meant to fit a variety of rifles, so it makes a lot of sense that they’re all the same size. Magnification: Some of these scopes are quite powerful and magnify up to 24 times! There are a few are adjustable and can magnify anywhere from, say, 3 times to 9 times depending on what you need. There are also some that come with a set magnification. Weight: The lighter a scope is, the less weight it will add to your rifle. That’s pretty obvious, right? To an extent, this boils down to preference. Maybe you like feeling the weight, maybe you don’t. Field of View: This is how many feet are visible in the scope at different magnifications. The closer you are, the less area you’ll be able to see. So, the higher the magnification, the less the field of view. Warranty: With 1 exception, our top picks come with lifetime warranties. Make sure you know what’s covered and what isn’t so that you’re prepared just in case something goes wrong. Even the best warranty might not apply to everything. Now that you know a little more about the important features of these products, let’s move into our rimfire scope review. Here’s how it works. We put our top pick and budget pick right at the beginning of the list. That way, if you’re in a hurry, you can find them first to get a good idea of what’s available. Keep reading if you can, all of our products are great! Ok, let’s get to our rimfire rifle scope reviews! When trying to find the best rimfire scopes, we knew when we found it that thus UTG 3-9X32 BugBuster Scope had to be our top pick. It has a lot of awesome features. First off, the emerald coating is great because it allows for maximum light transmission. We also really loved the mil-dot reticle that’s range estimating and helps you get extremely precise aim. It has both red and green illumination so you can use it effectively in a variety of conditions. Plus, the large field of view helps keep your eyes from straining too much. Get this: it comes with a 2-inch sunshade, flip-open lens cap, and easily detachable rings. Here’s the kicker: the True Strength design makes it really durable and gives long-term reliability. The CVLIFE Hunting Rifle Scope is our pick for best rimfire scope for the money. It’s made of high-strength, lightweight aluminum alloy so you know it’s durable and won’t bog you down. Because it’s completely sealed and nitrogen filled, it stays fog and rain proof. Plus, the adjustable dial illuminated reticle lights up in red or green. You can use it whether it’s night time or the lighting conditions aren’t good. The eyepiece is really awesome, it works with both near- and farsighted uses so that every view is clear. Why does that matter? No matter how your vision is, you’ll be able to see crystal clearly, even without wearing your glasses. That’s not all. The lenses are also covered with a scratch-resistant coating that will also keep dirt and oil away. Here’s our pick for best .22 rimfire scope. It’s from Simmons, one of the most popular brands in the country. One of the first things we liked about it was how sleek it looks. It’s made of high-quality materials and has a beautiful design. We particularly liked the matte silver finish. The tube is made of one piece so it’s lighter, stronger, and can take a little bit more abuse. The lens itself if fully-coated and gives you a really bright and sharp look at the world. Plus, the eyepiece was made with Simmons’ Quick Target Acquisition which gives your eye a break so you can react quickly. Get this: it’s waterproof, fogproof, shockproof, and recoil proof. And one more thing. This scope also includes a complete set of mounting rings. This is a good rimfire scope from Nikon that impressed us with its multi-coated optical system. Why do we say that? Here’s the deal: it transmits up to 98% of available light so you’ll get a bright view, even in low light. There’s a zero-reset turret to help make it easy to adjust in the field. You basically just use it as you normally would, lift a knob, turn it, and push it back down. That’s it! This is also in the running as the best rimfire rifle scope for long range shooting. The reticle has see-through circles that give you a lot of advantages when long range shooting but still allow you to see normally when shooting at close range. Nikon rimfire scope reviews are all pretty consistent. This is a great choice. Another choice for best .22 rimfire scope comes from BARSKA. There are some things we really liked about this scope. One is that it’s maximized for performance. It’s waterproof, fogproof, and shockproof. Plus, it has multi-coated optics that can be adjusted for both wind and elevation. 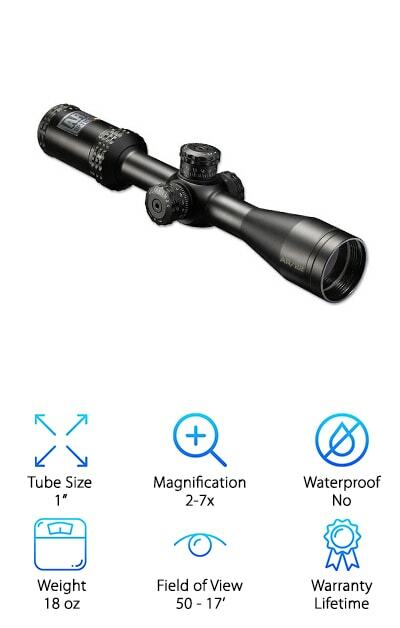 The body of this scope was designed to last which is why BARSKA also gives you a limited lifetime warranty. Another thing we liked is you get a good number of extras with this one, including mounting rings, lens covers, and a lens cloth. We also love the matte black finish because it looks cool and it’s easy to keep clean. 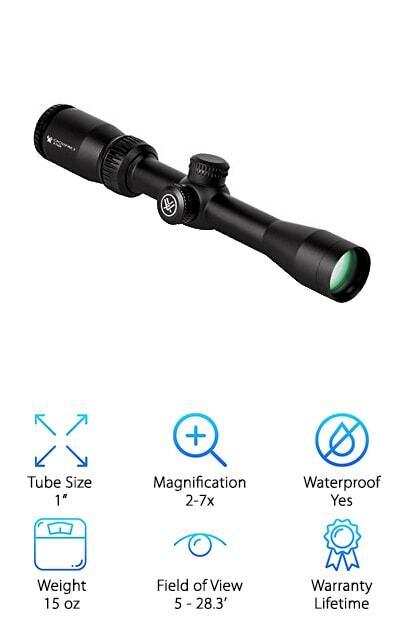 If you’re looking for a scope for hunting or a good choice for plinking, make sure that you give this one from BARSKA a closer look. This best rimfire rifle scope from Bushnell is great for any kind of shooting, but we really liked it for long range. Why? Because of the side focus parallax adjustment and because the eyepiece focuses so quickly. You can make really accurate adjustments with this scope so you get great precision. The optics are really bright, too, which will help you with your aim even when the lighting isn’t ideal at the end of the day or if the weather stops cooperating. 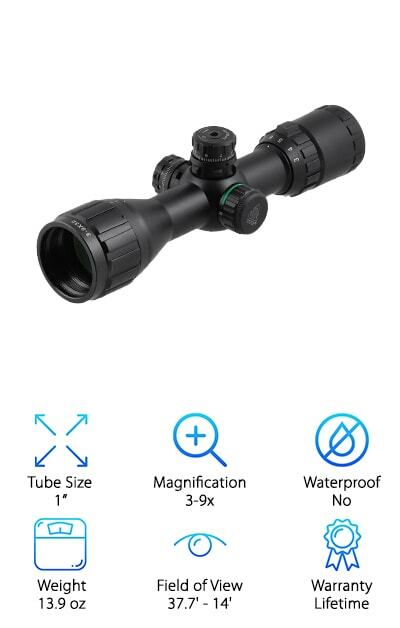 The scope is made of anodized aluminum alloy, which is really lightweight and durable. The matte black finish makes it rust proof and scratch proof and just looks very sleek when attached to your firearm. And here’s something we can really get behind: it comes with a limited lifetime guarantee. When it comes to rimfire rifle scopes, this Vortex Optics Rimfire scope easily found itself a spot on our list. For one thing, it’s made from a solid block of aircraft grade aluminum which not only lightweight but also strong and rigid. 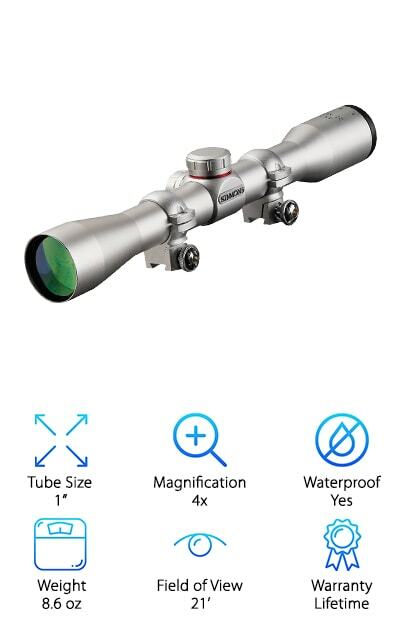 There’s a lot to love about this scope, including longer eye relief, a fast-focus, and multi-coated lenses. The tube has been nitrogen purged and sealed with an o-ring so you won’t have to worry about any water getting it. It’s fogproof and shockproof, too. There are lens caps included as well. They actually have a small bungee between to keep them together so both sides of the scope are safe and protected when you’re done using it for the day. One thing we should mention: you’ll need at least a medium mount. This rimfire rifle scope from Tasco is another one that just looks so cool. First of all, it comes with rings to fit it to .22 bases. The tube itself has a silvery black matte finish and is sealed well so it’s 100% waterproof and fogproof. 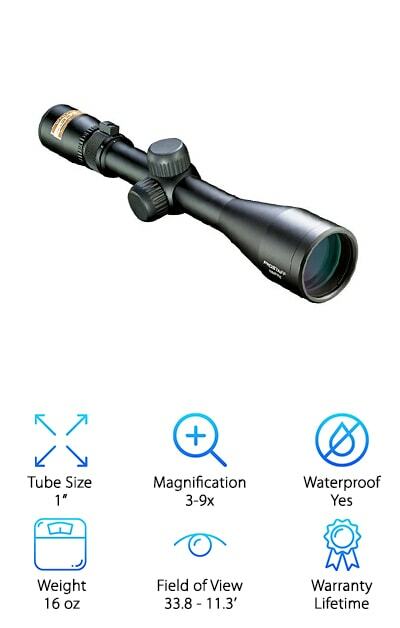 You don’t have to worry about the rain ruining your hunting trip with this scope. The multi-layered magenta lens coatings make the optics super bright and clear in part because it reduces reflections in the lens. Another great thing about this scope is that it’s really easy to use. Mounting it, zeroing it, and shooting with it are all surprisingly simple. If you’re worried about your budget, this is a good one to look at because it’s a great performer for the money. Although this Leupold VX-2 Rimfire Scope is really lightweight, it still packs a punch. 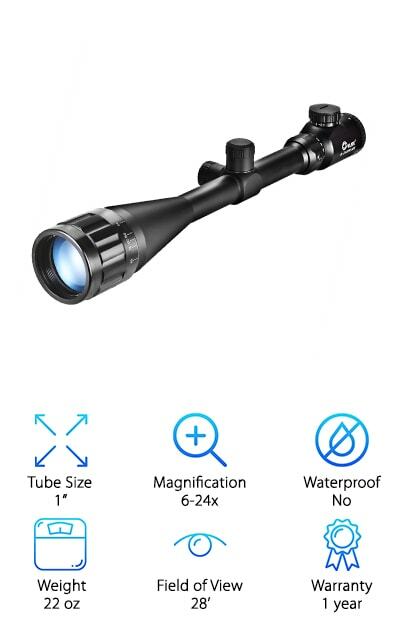 So, if you’re looking for something smaller and more compact than some of the other scopes we chose, this just might be the perfect one for you. This is an ideal choice if you’re heading out on a long hunting trip and have to fit everything into a small pack. It will take up less room and be easier to carry. It only weighs 8.8 ounces, you might not even know it’s there! Plus, it has the same multicoat 4 lens coating that all other Leupold models have so it lets a lot of light in. It’s also really easy to adjust for wind and elevation. 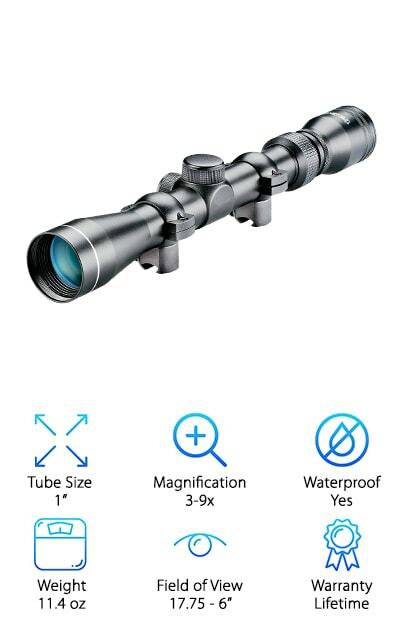 Don’t worry about getting stuck in the rain either, this scope is completely waterproof. The BSA Optics Rimfire Scope is another great option if you’re looking for something lightweight. What makes it such a great choice? It’s designed specifically for Rimfire and air guns and even comes with ? inch rail rings. It has fully coated optics that protect it from anything getting inside. 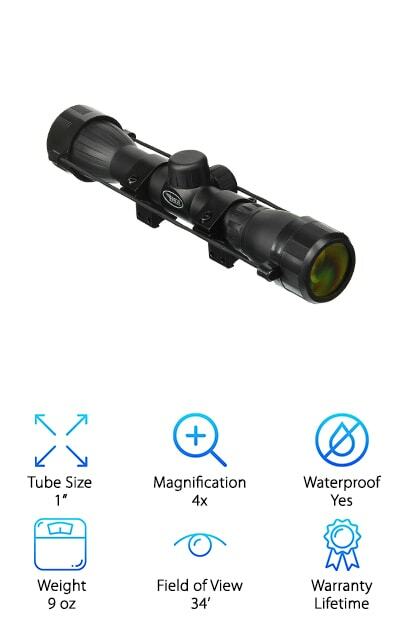 That means this scope is waterproof, fogproof, and shockproof so you don’t need to worry about getting caught in bad weather. Because of the generous eye relief and adjustable power configurations, this is a great option for almost any hunting or shooting situation. You can even adjust for wind and elevation on this compact scope. If you’re looking for another budget-friendly option, you should definitely check this one out. One more thing we should point out - it comes with a lifetime guarantee.